Kingdom of Elleore, on the island of Elleore, Roskilde Fjord, Denmark, which was purchased by a group of Copenhagen teachers in 1944 as a summer camp, but it turned into a gentle parody of the government structure and royal traditions of Denmark. The novel Robin Crusoe is banned on the island, and everyone uses Elleore Standard Time, which is 12 minutes behind Danish time. It has had six monarchs in the last 70 years. Celestia (or The Nation of Celestial Space), created by James Thomas Mangan in Evergreen Park, Illinois, on January 1, 1949, claiming all of outer space. Mangan sent some letters to the United States, United Nations, United Kingdom and Soviet Union to stop all further atmospheric tests, and warning them not to encroach on his so-called "territory". The nation had more than 19,000 citizens in 1959 (after a booklet was published about Celestia), but it may have become defunct after the death of Mangan in 1970. The Principality of Seborga, Seborga, Italy, founded in 1963 by Giorgio Carbone, who claimed that the town had never become part of the modern Italian state. The small constitutional elective monarchy with less than half a hundred inhabitants is now led by Prince Marcello I (Marcello Menegatto, 2010-). The town issued a local currency named luigino between 1994 and 1996, and they still have two orders of knights (The Order of Saint Bernard and the Order of the Holy Sepulchre). 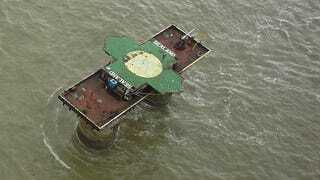 The Principality of Sealand, on a WWII installation to guard the port of Harwich, Essex, UK, named HM Fort Roughs. It stands six miles from the coast of Suffolk. The place was occupied by a British pirate radio broadcaster named Paddy Roy Bates (Prince Roy) and his family in 1967. Eight years later the Principality was established, and Roy led this until his death two years ago at the age of 91. He named his son Michael as the new leader of the nation. And here's an opportunity to become a Lord, Lady, Baron or Baroness for only a few bucks, and a Count or Countess for almost $340. Freetown Christiania, a self-proclaimed autonomous neighborhood in Christianshavn, Copenhagen, Denmark, declared in 1971, and regarded as a large commune with special laws since 1989. This micronation had the first national Webpage (in November 1995!) and it has an Anthem titled Stand Tall Talossans. Now it has a king named John I, and the current population is 222. A group of dissidents left the Kingdom, and created the Republic of Talossa in 2004, but they returned two years ago. The nation has some wild territorial claims — stretching from part of Milwaukee to an uninhabited French island and a large part of Antarctica. The Republic of Kugelmugel, a spherical house in Vienna Prater, Vienna, Austria, designed by Edwin Lipburger. The micronation declared independence 30 years ago after some arguments between the artist and Austrian authorities due to lack of building permits. Aerican Empire, founded in May 1987 by Eric Lis, without any territory of its own, but its few hundred members (about 400 in 2009, 233 in July 2013) started to claim sovereignty over some disconnected territories: a house-sized area in Montreal, Canada, a colony of Mars, an imaginary planet, the northern hemisphere of Pluto, an island in the middle of a lake in New Zealand, and a square kilometer of land in Australia, among others. The Gay and Lesbian Kingdom of the Coral Sea Islands, founded as a symbolic political protest by a group of gay rights activists, led by Dale Anderson in 2004, on Coral Sea Islands, Queensland, Australia. Filettino, a small village about 40 miles (70 km) east of Rome, Italy, with a population of 577, became an "independent state" in 2011, when the Italian government announced that all villages with under 1,000 inhabitants must merge with nearby ones, to save money.